Key topics of interest for facility owners, such as regulation updates, proper content of an OSHA/ANSI safety sign and specific standards information. OSHA requires employers with confined spaces to post signs nearby and to have a permitting process in place. Our signs are your starting point to fulfill this OSHA mandate. Seconds matter when people need to escape from your building during crisis situations. Accurately communicating proper evacuation paths is essential to saving lives. Clarion egress pathmarking signs and markings help you achieve the objective of being able to quickly evacuate your people from buildings. According to NFPA 79, enclosures that do not clearly show that they contain electrical devices must be marked with a safety sign in accordance with the ANSI Z535 standards. Use the new formats to more effectively communicate your company’s electrical safety procedures. The OSHA lockout standard is extensive – and rightly so as many workers are killed or severely injured each year because lockout procedures were not followed. 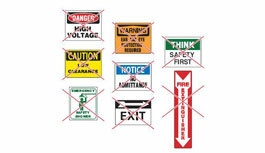 Our signs can help you to communicate lockout/tagout and be in compliance with OSHA. Emergency shower signs help your employees to find this important equipment in emergency situations. Best practices dictate that a sign be posted above the actual equipment, and directional versions of the sign posted wherever people need to know the shower’s location but cannot actually see the equipment or its sign. If your facility is in a crisis situation – such as during a fire, earthquake or terrorist attack – time is of the essence. Not only is it essential for building occupants to be able to evacuate work places and public areas quickly, but fire, rescue, and medical teams must use wayfinding information to provide aid. Our escape plan signs can be an integral part of your facility’s safety sign guidance system. Like emergency shower signs, eyewash station signs help your employees to find this important equipment in emergency situations. Best practices dictate that a sign be posted above the actual equipment, and directional versions of the sign posted wherever people need to know the eyewash station’s location but cannot actually see the equipment or its sign. OSHA is very clear on the requirement for employers to identify the location of fire extinguishers. In emergency conditions, such as fires, there’s not a moment to lose when you must locate extinguishers. Clarion fire extinguisher signs use the latest ISO/NFPA symbols for compliance with current global best practices. Like fire extinguishers, fire hoses need to be clearly identified so their location can be easily found in the event of an emergency. Clarion’s fire hose location signs use the latest ISO/NFPA symbols to help you communicate the location of this important equipment to both employees and emergency personnel. From first aid stations and stretchers to emergency phones and AED devices, our first aid and emergency equipment signs help your people to find essential equipment in the event of a crisis situation. Forklift traffic accidents are a major concern for many facilities. Proper training permanently reinforced by our safety signs for both forklift drivers and pedestrians can help you to reduce the risk of injuries and deaths due to forklift collisions. ISO 45001, the first global standard for occupational health and safety management systems, gives organizations in the U.S. and around the world a structure to plan, support, implement and evaluate their efforts to eliminate or reduce risks to workers. The Occupational Safety and Health Administration’s (OSHA) regulations for safety signs, tags and colors changed in 2013 as the result of a six-year effort led by Clarion. The new regulations are in line with today’s best practices for visual safety communication and have important compliance and liability implications for those responsible for workplace safety. The bar for safety communication in the U.S. has risen. When employers require their workers to use personal protective equipment (PPE), our safety signs become an integral part of their PPE program. 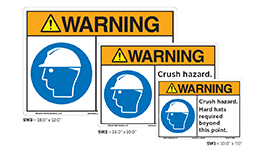 By incorporating the latest OSHA-approved formats and internationally accepted symbols, our PPE signs serve as visual reminders that reinforce PPE training and compliance. For U.S. companies, a major connection is being drawn between their liability exposure and their safety sign systems. Courts are now finding that those responsible for safety must provide people with the information they need to be aware of potentially hazardous situations and to explain to people how to avoid them. A confluence of recent events is creating the beginnings of a significant liability issue for building owners, premises owners and employers. The “failure to plan” is one of the newest theories of premises liability and it involves the need to rethink your safety signs and markings. The content of your facility’s safety signs is something that needs to be thoughtfully considered. Off-the-shelf, standard Clarion signs may suit the majority of your needs. But there are times when customization is required to make your sign’s content directly relevant to a given situation. 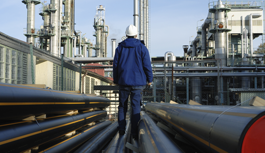 Employers are required to make the location of their safety data sheets (SDS) known. Formatted in a global manner, our safety data sheet signs can help you to meet this regulatory requirement. Viewing distance, legibility and space limitations are important factors when choosing the right sizes and shapes for safety messages on equipment and in workplaces. Clarion Safety makes it easy to pick the size and shape right for you, with our standard options and expert customization services. Most safety signage in use today is based on outdated, 70-year old standards. Clarion’s sign systems are different – they incorporate the most current ANSI and ISO design features that enable people to better identify and avoid hazards, locate emergency equipment and find egress routes in times of crisis. To better protect workers from hazardous chemicals, OSHA has adopted the “Globally Harmonized System of Classification and Labeling of Chemicals” (GHS). As your go-to source when safety communications must be done right, we offer information to help you and your employees understand GHS; a centralized OSHA GHS learning center for your workplace. Water presents a very real hazard and risk to people who are unaware. Effectively communicating aquatic safety hazards through the right safety signage allows swimmers to take necessary precautions to keep themselves and their families safe. They also play a role in reducing liability risks for facility owners. 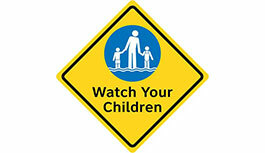 Learn more about water safety signs below.